NASA's Mars rover Opportunity captured this self-portrait on March 22, 2014. The White House's proposed fiscal year 2016 budget allocates no money for Opportunity's mission. NASA's long-lived Mars rover Opportunity mission is poised to lose its funding in 2016, but that financial future is not etched in stone, space agency officials say. "We will look at continuing the operation of those activities, and finding ways to fund them, if in fact they actually are operational by 2016, and the science value does make sense," Radzanowski said. Indeed, neither Opportunity nor LRO were allocated funds in the White House's fiscal year (FY) 2015 budget request, but money has been found to keep both missions going, he added. It's also worth nothing that the 2016 federal budget proposal is just that — a proposal. Final funding for NASA and other federal agencies must still be approved by Congress. For example, the FY 2015 White House request proposed grounding NASA's Stratospheric Observatory for Infrared Astronomy, a telescope installed inside a 747 jet, but Congress later allocated funding to the project. Opportunity and LRO got $14 million and $12.4 million, respectively, in FY 2014. It's unclear at the moment exactly how much each mission will get during the current fiscal year, NASA officials said. 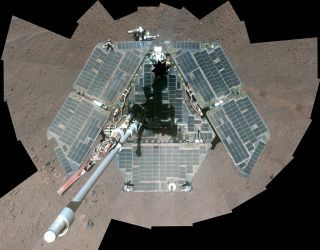 Opportunity and its twin, Spirit, touched down on Mars a few weeks apart in January 2004, and were tasked with three-month missions to search for signs of past water activity on the Red Planet. Both rovers found plenty of such evidence, which helped to reshape scientists' understanding of Mars and its history. And the two golf-cart-size rovers just kept rolling along. Spirit stopped communicating with Earth in March 2010 and was declared dead in 2011. Opportunity remains active; it has been exploring the rim of 14-mile-wide (22 kilometers) Endeavour crater since August 2011. Opportunity is showing some signs of age, however. The rover's robotic arm has long been a bit arthritic, and Opportunity recently began experiencing problems with its flash memory, which allows the rover to store information even when the power is off. To date, Opportunity has traveled 26.02 miles (41.88 km) on Mars — farther than any other vehicle has gone on the surface of another world. The previous record of 24.2 miles (39 km) was set by the former Soviet Union's Lunokhod 2 moon rover in 1973. The sharp-eyed LRO spacecraft launched in June 2009 to map the moon's surface in great detail, and to help pave the way for future robotic and human missions to Earth's nearest neighbor. The White House allocates $18.5 billion to NASA in the FY 2016 budget request, which would be a $500 million boost over the enacted budget for FY 2015.